Information technology can become a good development tool for the rural India. But can our villages be logged on to the infotech highway with poor infrastructure in terms of power supply and connectivity. Can we provide information to the common man in his own language? There was a village in India, far away from the highway. It had become very poor. The land yielded very little. Water was either scarce or polluted. The forest had been razed. Village folk would migrate to town for employment. They'd heard of computers. It didn't mean a thing. They had heard that rich city folk send their children to 'America' to become software engineers. This, too, meant nothing. The village school taught children till fifth standard only. From here the story can go anywhere. Information technology (it) is at a stage where it is generating a lot of talk and, it must be said, hype. Every other day, you will read or hear politicians and bureaucrats announce new it schemes. They never fall short of promising a revolution; benefits for the poorest of the poor and bringing India's villages to the 'national mainstream'. There are two kinds of reactions to this hype. One is sceptical, typical of the old-timers in our little tale who see nothing in computers but another expression of the plastic age. The other reaction is stupefaction, more typical of the younger generation ever ready to embrace something new, even if it promises the moon and stars to boot. The reality, fortunately, is not as stereotypical. • Power availability; a major worry in a power-starved country that can't adequately power its cities, forget villages. • Connectivity, through telephone cables or otherwise; would require some imaginative thinking. • Software in Indian languages; not difficult in a country that leads the software market. There are numerous solutions. Experts have already come out with loads of good suggestions. They need to be heeded with urgency. Information is important. Market rates are crucial, as much for the stockbroker on Mumbai's Dalal Street as the farmer who looks for the market that offers the best price for the season's produce. Yet the benefits of India's it boom have been restricted to the urban elite. Experts in it point out that the trickle-down theory -- let us provide the best facilities in metros and they would eventually reach rural areas -- will not work. A new technology remains the property of a few till it is actively developed to serve the needs of the wider populace. Then, the economies of scale set in. Remember times when radio transistor was a status symbol and penicillin was a good idea. Moreover, technologies that do not evolve are simply cast aside. Can IT evolve to serve rural India's needs? To get a fair idea of the potential and problems, we bring you lessons from some it experiments in rural areas. The dairy cooperatives of Anand in Gujarat are using it applications to streamline procedures, making a significant difference to the lives of milk producers in surrounding villages. There are several other positive examples. An important reason for their success is the fact that their it solutions service the rural market. People take to it only when they are convinced that it serves some purpose in their lives. If that happens, they don't wait for government assistance. Government it schemes, however, have done poorly. The e-governance scheme of Rajasthan state government has failed to deliver because of extremely centralised planning that did not take local infrastructure conditions into consideration. Despite the fact that the software is easy to use and the content is in Hindi, the scheme not only alienates villagers but also lends credence to the view that it in villages is hogwash. The state government agency that developed the software is disillusioned with the bureaucracy. We also spoke to several it experts about the issue. Most agree that the hype about it is undermining efforts to find practical technological solutions. There is also good reason to believe that it will meet rural requirements only when small-scale operators are involved. A good example of how this can happen is the way cable television has spread through India. A pilot project is trying to utilise railroad cables to provide internet in Andhra Pradesh to areas that had no access to internet. This system can cut down costs by half. But the project lies in limbo with Indian Railways resorting to typical bureaucratic delays. One of the people involved in the project is a Chennai-based electrical engineer keen to combat the rural-urban digital divide through technological innovation. He has led the development of an encouraging model called cordect that can connect villages through wireless systems that are cost-effective. The greatest worry is electricity supply. But a project in Pondicherry is combining the power supply from the grid with battery backup and solar power. Draught power from livestock can be used to generate 40,000 megawatts of power in villages. In the pages to come, we provide a realistic view of an issue that is little more than speculation today but promises a lot for tomorrow. THIS is Anand in Gujarat, birthplace of the cooperative movement in dairying that has come to be known as the White Revolution. Having made the most of dairying, some 3,000 villages in Anand and Kheda districts are making a different kind of transition. Now it is not just about increasing productivity. The emphasis is on efficiency. The tool is the automatic milk collection system (AMCS), an it initiative by Amul (the Anand Milk Union Limited). A computerised system, it allows the reading of milk quantity and quality (for fat content). "It maintains daily records of milk societies at the village level," says Subbarao Hegde, head of information and systems division at the Gujarat Cooperative Milk Marketing Federation Limited (GCMMFL), Anand. Mogar village is about 20 km from Anand. The cooperative dairy society here, which collects about 1,600 litres of milk everyday, has an amcs. Udai Singh, secretary of the society, says they purchased the device three years ago for Rs 35,000. "The society picked the tab. No loans, no subsidy." It has made a significant difference. R S Sodhi, general manager of GCMMFL, explains that in the previous manual system, two to three days were spent on collecting information on the quality and quantity of milk deposited by each member. Payments were worked out manually, which consumed a lot of time. The producer was sometimes paid ten days after depositing the milk. "Making payments is now a matter of seconds with the amcs," says Dilip Singh, cashier of the society. About 200 members can deposit milk within one hour. In the previous system, milk was tested only after all collections had been made and test samples stored in plastic bottles. "This led to unhygienic conditions. The earlier method for testing milk for fat content was very cumbersome. Among the disadvantages was handling of corrosive chemicals. All these added to the cost and time," says Jayen S Mehta, group product manager with GCMMFL. "Everything gets done through the machine now; daily reports, monthly reports, year-end calculations," says Udai Singh. Transactions have become very easy. Earlier, the producers would get suspicious about the measuring scale or the quality testing apparatus. A producer would not able to remember the quantity or quality of milk deposited. "It was easy for the person recording the information to manipulate the data and cheat the producer," says Sodhi. The cooperative society at the nearby Gopalpura village has spent Rs 1,40,000 on a power generator to deal with breakdown in electricity supply. This marks how well the village has taken to the computer-based AMCS it purchased for Rs 49,000 three years ago. The society had footed the bill without any assistance. Of the 1,000-odd societies in the Kheda milk union, about 160 have a computer-based amcs, Parmar informs: "We are planning for another 200 amcs machines. The computer is costly. So, in the case of small societies, one system is shared by two to three villages." NYALA, a sleepy Rajasthan village 20 km from the state capital Jaipur, was to become an example of what it can achieve in villages. Instead, it has become an example of how badly planned programmes flounder. On March 23, 2000, the then us president Bill Clinton visited the village amid much fanfare. Among other things, he was impressed by the fact that a woman from the village could get information on neo-natal care from the internet. On his return to the us, while addressing a national conference on building prosperity, Clinton stressed the need for similar community computer centres all over the Mississippi delta. The Rajasthan state government had put up the computer kiosk under RajNidhi, a highly ambitious programme aimed at a "new era of e-governance" and connecting villages through internet. The web-enabled information kiosk system has been designed by the state's it department in collaboration with RajComp, the state agency for computer services. It can be a brilliant data warehouse if used properly. 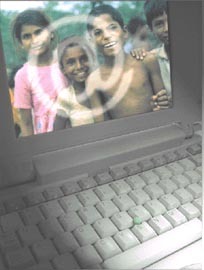 The software has provision for content in Hindi to enable rural people's access to information related to health, family planning, immunisation schedules for children, employment, transportation, distance education, agriculture, water and electricity connection, birth and death registration, approved housing societies, rates of land and building taxes. The state government had planned that all the 9,184 panchayats would have a RajNidhi kiosk by 2003. 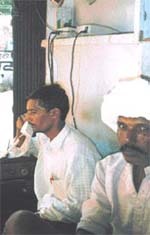 Nyala was the first place where a RajNidhi kiosk was set up. It may be the last. No other village has got a computer under RajNidhi as yet. One year down the line, the Panchayat Bhavan of Nyala, where the computer was installed for Clinton's perusal, wears a deserted look. 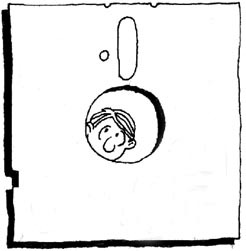 The computer lies in a small room under lock and key. "It hasn't worked since that day," says Ramkrishan, a village elder. "We were given a temporary telephone connection for internet. That was taken away right after the Clinton visit," says Kaluram, head of the village panchayat. "We have applied for a telephone connection but nothing has come through despite three reminders. The telecommunication department hasn't even bothered to reply." But why isn't the computer employed for applications that don't require internet? It contains 4,000-5,000 different forms, covering almost all possible areas for which people have to go to the collectorate and other government offices. Well, the villagers lack enthusiasm and the software lacks regular updating. "We got trained in operating the computer at Jaipur. We don't remember much as nothing was put to practice," says Kaluram. Sanjay Gaden, systems analyst at RajComp and one of the brains behind RajNidhi, says the people responsible for the set up were not allowed to get anywhere near the computer during the Clinton visit due to security reasons. 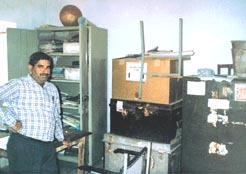 A Rajasthan government release from April 2000 says "there is considerable enthusiasm among the people of Nyala about the computer system." Officials at RajComp say the villagers and the local administration of Nyala are not very receptive to IT. Kuldeep S Barar, general manager RajComp, says software updating doesn't happen due to lack of communication from departments concerned about changes in procedures. This can cause legal hassles, Gaden points out. "We have approached the chief secretary several times, requesting him for better interaction among various departments and RajComp. But nothing has been done about it," another RajComp official points out, asking not to be named. The state government has also delayed action on applications from the public to open private internet kiosks with software developed by RajComp. A very detailed application questionnaire was prepared and distributed to those interested about one year ago. The response was very encouraging. "We sent a note, requesting for permission to grant licences and required infrastructure support to prospective operators in Jaipur," says Gaden. There has been no action. The file has become quite thick. The computer at Nyala remains locked up in the dingy room. People who could use the services continue getting harassed at the hands of the insensitive government machinery. A us development agency donated three computers to the girls school in Nyala. Five months down the line, the school is still waiting for an electricity connection. The computers are locked in trunks. All pleas have fallen on deaf ears. Yet 20 metres from the school runs the main power line. Do we have the technological wherewithal to connect villages right across India? How much will these technologies cost? Can we afford them? The most daunting challenges can be summarised in three categories. "There are barely 29 million telephones in India. Telecom infrastructure in small towns and villages hardly exists. Even in urban areas, each telephone connection costs more than Rs 30,000. To break even, an operator needs to earn at least Rs 9,000 per year. Not more than 3-4 per cent of the urban population can afford this," says Ashok Jhunjhunwala, head of electrical engineering at the Indian Institute of Technology, Chennai. Telephones in villages are far more costly -- per line cost is often quoted at Rs 70,000-80,000. To break even, the annual revenue per line has to be about Rs 20,000. This is just not affordable, says Jhunjhunwala. Internet in urban areas costs about Rs 25 per hour just for access. The cost can be astronomical in villages. One hour of internet can cost Rs 1,200 just for access in a village or a small town near Trichy in Tamil Nadu if the internet service provider is in Chennai. Even if the service provider is in Trichy town, the hourly cost from a distant village could be Rs 150, Jhunjhunwala calculates. If we wish to add 100 million telephone lines over the next seven to eight years, it would take an investment of Rs 2,00,000 crore (if the cost per connection is estimated at Rs 20,000). This is just not possible, Jhunjhunwala indicates. Unless cost-effective solutions are developed small towns and rural areas would remain neglected (see box: Line it up). For nearly a century, telephone connections have depended on pairs of copper cables. Rising costs have made the copper-wired local loops expensive. If subscribers are spread out, as is the case in rural areas, each user requires separate access loops from the exchange, sending the costs through the roof. Jhunjhunwala says wired systems are not the solution for rural areas (see p34: Wireless for villages). Poor supply is a major hindrance. "Even if villages have power connections, supply is so irregular that computers cannot run," says Mahesh Uppal, telecom adviser to the New Delhi office of the Canadian International Development Agency. India's power generation and transmission record is so poor that it cannot be expected to meet the demand of taking it to villages. Power backup using batteries is only a temporary solution. Can renewable energy meet the challenge? "Solar power is a good solution, but relatively costly at the moment," says Subbiah Arunachalam, informatics director with the M S Swaminathan Research Foundation in Chennai. 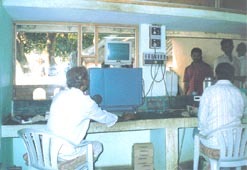 The foundation is running a project of computerisation in Pondicherry villages. "At Villianur, our hub centre in Pondicherry, we use a combination of mainline electricity, battery pack and solar power. The circuit senses the load at any given time and automatically draws power from one of the three sources," says Arunachalam. "Telephony can easily be provided with solar power. But internet is a different proposition," says Jhunjhunwala. The only long-term solution is decentralised power generation, possibly using renewables. In the hilly regions, the answer could be microhydel (see 'Power the people', Down To Earth, November 30, 2000). Areas with good wind energy potential can resort to that (see 'Gone with the wind', Down To Earth, June 30, 1999). Fuel cells hold a lot of promise and there is already talk of the future of the hydrogen economy (see '2H2 + O2 = 2H2O + energy', Down To Earth, July 31, 2000). The key lies in coming up with technological solutions that facilitate local electricity generation, rather than depending on centralised systems. Computers and internet are completely useless in villages if their content is in English. Even if software is available in India languages, the poor literacy levels will ensure that a vast majority remains out of reach. Is it only for the urban elite? Not really. "The language problem can be solved quickly as one starts installing computers in the rural areas," says Jhunjhunwala. "Technology can overcome the barriers of literacy and language. Multimedia and multilingual software can provide the solutions," says Anil K Gupta, professor at the Centre for Management in Agriculture of the Indian Institute of Management, Ahmedabad. Even the illiterate can be involved through the visually rich multimedia applications. "More than a third of the people in the community we work with are illiterate. We use multimedia tools. Language is no longer a problem and solutions are inexpensive," observes Arunachalam. "All our computers are Tamil compatible. Many of our databases -- insurance information, animal rearing -- are in Tamil," he says about the Pondicherry project. Several efforts are on to develop software in Indian languages. "India has the status of a world leader in the development of software-based language translation which finds application in pagers and computers for non-English speaking users," says R A Mashelkar, director-general of the Council of Scientific and Industrial Research. To promote it in rural areas it is essential to cut the hype. Perhaps information technology will not deliver all that it promises even if all infrastructure changes are made. No matter what the experts say, the decision to use it finally rests with the people. All that scientists, governments, policymakers and the civil society can do is provide the option. "IT isn't a magic mantra. There is too much hype. A desire to change has to come first," says Subhash C Bhatnagar, it guru at the Indian Institute of Technology (IIM), Ahmedabad. The IT industry is dynamic and will grow no matter what. If the government doesn't adapt, it will be bypassed. Right now, all government efforts focus on maximising profits for the software sector. Some rural schemes are thrown in for the sake of political correctness. But shoddy planning ensures that they are a waste of public money. Rather than making it an agent of change for equity, the government is actually financing an urban-rural divide in the digital arena. The urban media blindly follows suit. "As of today IT for rural development is only a slogan," says N C Saxena, secretary to the Planning Commission who was earlier with the department for rural development. But Saxena is still positive. He points out that land is the main resources in villages, and information pertaining to ownership is often confined to an exploitative few: "Computerisation of land records is one example of how it can go a long way in helping farmers, preventing their harassment at the hands of petty government officials. Take the case of agriculture. The age-old concept of village-level worker for extension activities has completely flopped. The only way you can reach the farmer is by transcending bureaucracy. it can do that. Innovations like drip irrigation can be of great use to farmers and this information can reach them through it. This can also generate pressure for downward accountability in the bureaucracy. Instead of being accountable to their seniors, the bureaucracy will have to be accountable to the people," Saxena stresses. "We have to adopt the strategies through which we can bypass the de-motivated and indifferent bureaucracy. IT can help reach people directly," he concludes. Several experts say the best way is to take up a pilot project, complete in all respects, show its benefits to the people, and move to another area. "We have to go in for indigenous technologies like cordect to reduce costs," says N Vittal, member of the IT Task Force that reports to the prime minister. The slogan for the it age might as well be: think small, think decentralised. The cordect man Jhunjhunwala and Bhatnagar of iim Ahmedabad predict a major role for the small-scale private sector in bringing it to rural areas on the lines of the spread of cable television. it works better in villages if it is owned, controlled and managed by the community, as against individual ownership, says Subbiah Arunachalam of M S Swaminathan Research Foundation in Chennai. "IT stimulates expansion of the private sector," says Robert Schware, senior informatics specialist at the Global Informatics and Communication Technologies Department of the World Bank Group. As things stand, government policy doesn't seem to have too much room for sane advice. Its efforts are limited to championing the cause of the software industry. It has to realise one very important thing -- the whole of software industry cannot generate as many votes as the 70 per cent of India that lives in villages. There is good political capital to be made out of promoting rural development through IT, at least in some areas, if not all.